This brush-driven, user-friendly Aztec Pro-Scrub automatic floor scrubber provides a wet scrub, and then a dry vacuum in one pass and is one of the best-selling, most inexpensive and easy to maintain walk behind scrubbers we offer. The 24 volt battery system provides approximately 3 hours of scrub time on a full charge while the 12 gallon tank provides plenty of solution to do most jobs. The large capacity 15 gallon recovery tank should always be protected with an auto scrubber defoaming agent like our Core Liquid Degreaser Defoamer to help protect the vacuum motors. Cleaning professionals love the ProScrub because it is, "Exceptionally simple to operate and maintain." As an added bonus this popular machine includes your choice of a pad driver and one 20 inch red floor scrubbing pad or one nylon scrubbing brush. Also comes with a one year warranty. In addition to Aztec floor cleaning machines, we also carry many other popular brands including a great selection of private label industrial floor scrubbers. Any of our machines will make your job easier than ever before and save you time. Once you scrub your floor with an auto scrubber, you'll never go back! 12 gallon solution & 15 gallon recovery tank provide plenty of coverage for most scrubbing jobs. 30" squeegee allows the Aztec Pro-Scrub to fit through all standard doorways. 24 volt battery system provides a 3 hour run time on a full charge. 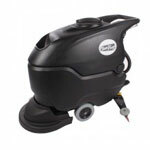 Comes with pad driver and a red pad or a nylon brush to scrub your floor as soon as you receive your machine. 1 year commercial warranty on the full scrubber.